Traditionally, central clearing was established to shift risk from traders to the central counterparties, and in exchange the CCPs were able to use the substantial collateral assets for their own investments. The new central clearing requirements on over-the-counter derivatives, on the other hand, are intended to promote overall risk management. The financial market turmoil that started in 2007, gives the regulatory agencies the opportunity to investigate on the causes of the financial crisis. They have identified OTC transactions as one of the potential causes to the global financial crisis and come to the conclusion that this market should be “secured”. The common agreement has been to move the OTC trading system to a Central Clearing Party CCP platform. The main idea is to introduce CCPs, trustworthy financial institutions, in order to replace the bilateral relationships that prevailed between two counterparties, by centralized multilateral relationships involving CCPs. The seller would sell the contract to the CPP and the buyer will buy the contract from the CCP. This will introduce an effective monitoring since the CCP can stipulate the required collateral and monitor the positions of the two parties under new regulatory rules. This new infrastructure implemented for the OTC Derivative market will in theory reduce considerably the global counterparty risk observed into this market. Since 2008, new regulations on both sides of the Atlantic make the promotion of CCPs — most notably the Wall Street Reform &Consumer Protection Act (widely termed the “Dodd-Frank Act” or DFA) in the US, and the European Markets Infrastructure Regulation (EMIR) in the EU. And also similar initiatives are initiated in Asia as well. The Dodd-Frank Act, were signed in July 2010,elaborated to reduce systemic risk and increase market transparency through several measures including limits on proprietary trading, tighter regulation of swaps trading, and the requirement for an institution to clear standard OTC Derivatives at Central Clearing Counterparties. These measures are being mirrored in Europe. With EMIR – a key part of the European Union’s wider regulatory agenda, which includes MiFID – the EU is seeking to increase stability in the OTC derivative markets, by imposing new reporting and clearing obligations, measures to reduce counterparty credit risk and operational risk for bilaterally-cleared OTC derivatives, and common rules for central counterparties (CCPs) and for trade repositories. The effect of these regulatory responses is to change the nature of the counterparty risks on OTC derivatives from bilateral to centralized model. OTC Derivative trades are largely unregulated and exposed to maximum counterparty risk. Regulators attempt to gain some insight into this opaque market. OTC Derivatives are contracts that are traded and negotiated, directly between two parties, without going through an exchange or other intermediary. Products such as swaps, forward rate agreements, exotic options - and other exotic derivatives - are almost always traded in this way. The OTC derivative market is the largest market for derivatives, and is largely unregulated with respect to disclosure of information between the parties, since the OTC market is made up of banks and other highly sophisticated parties, such as hedge funds. Reporting of OTC amounts are difficult because trades can occur in private, without activity being visible on any exchange. According to the Bank for International Settlements, the total outstanding notional amount is US$708 trillion (as of June 2011). Of this total notional amount, 67% are interest rate contracts, 8% are credit default swaps (CDS), 9% are foreign exchange contracts, 2% are commodity contracts, 1% is equity contracts, and 12% are other. Because OTC derivatives are not traded on an exchange, there is no central counter-party. Therefore, they are subject to counter-party risk, like an ordinary contract, since each counterparty relies on the other to perform. ETD derivatives instruments are traded via specialized derivatives exchanges or other exchanges. Such derivatives instruments include futures and options with various underlying asset classes such equities, fixed income and currencies. A derivatives exchange is a market where individual’s trade standardized contracts that have been defined by the exchange. It acts as an intermediary to all related transactions, and takes initial margin from both sides of the trade to act as a guarantee. 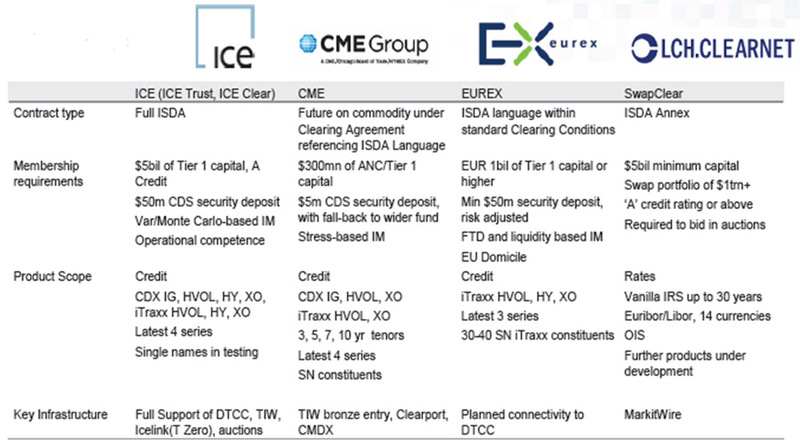 The world's largest well known derivatives exchanges by number of transactions, are the Korea Exchange (which lists KOSPI Index Futures & Options), Eurex (which lists a wide range of European products such as interest rate & index products), and CME Group (made up of the 2007 merger of the Chicago Mercantile Exchange and the Chicago Board of Trade and the 2008 acquisition of the New York Mercantile Exchange). ETD contracts have traditionally been very liquid and their corresponding derivatives are easily standardized. The traditional exchanges traded are well used to transfer market risk among participants. OTC contracts have been used to transfer other kinds of risk such as credit risk and interest rate risk and have proved difficulties to be standardized. Indeed derivatives contracts nature’s involves two participants to take opposite view on an underlying asset. In the case of equity underlying it is easy to find a counterparty that takes an opposing view on the direction because these risks are easy to perceive through a few parameters. But it is no longer the case when you deal with an interest rate or credit risk underlying because you need then much more information. In particular the valuation of interest rate derivatives is a function of the frequency of payments, the particular floating rates and depends on the entire yield curve structure. For the credit derivatives the big issue to overcome is to estimate correctly the default probabilities. As a result trade in complex derivatives transactions are slow and finding counterparty would be difficult as it will be rare for another party to have the exact opposite hedging requirement. Here intervene on the market the role of market makers. Market makers became key participants for non-exchange traded OTC derivatives market meaning that certain large financial institutions with enough capital are offering to enter into such transactions (in either direction) with end users who want to hedge their risk. These market makers hedge their own risk either by transacting with another end user or with another market maker in the opposite direction. 90% of the overall OTC transactions are dealt with a few bank institutions. This means that if one of these banks became insolvent then a significant proportion of OTC trades would be defaulted on. This potential default would also impact numbers of market makers. And since OTC trades were not regulated, it is quite impossible to estimate the impact on the market that a default by a market maker may cause. Thus in the absence of any regulation, market makers themselves had very little idea on how much risk they were exposed to. By definition OTC trades were not traded on exchanges this implies a bilateral relationship between a client and a market participants generally a bank (only two party involved in the contract). Therefore banks had to maintain bilateral clearing relationships and legal agreements with numerous other parties. Lack of standardization for clearing agreements means slow workflow. Additionally, bilateral clearing relationships also means for marked to market trades, that the party in the money would collect collateral from the other party in order to reduce the risk of default. A typical market making bank would have clearing relationships with numerous clients and would therefore need to maintain collateral payment processes with each party. If any party goes bankrupt the counterparties who had deposited collateral with the bankrupt parties typically could not recover their collateral. Such bilateral clearing relationships could make unstable the whole market. To reduce the above disadvantages described in previous section, central counterparties have now emerged to facilitate clearing of OTC derivative trades. Central counterparty clearing involves every trade between two participants getting intermediated by the clearing house. Indeed the clearing house becomes the counterparty for both the original trade participants. This approach has the advantage of requiring fewer clearing relationship agreements (each party with the clearing house). It also allows trade participants to reduce their counterparty credit risk. The counterparty credit risk is mitigated because the clearing house is the only counterparty for trade participants and it is a firm which is able to take active risk on its books through other lines of businesses. It is now essential that the risk of default of the clearing house itself is reduced to maximum degree possible. This business model involves the clearing house being owned by the major market participants (banks which are the market makers. The protection layer for the clearing house is the capital infused by these participants. The clearing house will be a for profit entity. In order to reduce the risk of default Regulators mandates a certain threshold of capital requirement and restricts the Clearing House from deploying its fund in any kind of strategy. In this model the cost to market participants is charged through higher transaction costs. One of the major differences between provided Clearing Houses services is the type of products supported by the Clearing House as shown the table below. This criterion relates to capital requirement that a member need to satisfy. If a participants fails to meet these requirements he cannot be a member of the clearing house but can only clear its trades through another member if the clearing house offers client this clearing services. A typical central counterparty platform will only intermediate trades where both participants are members of the clearing house (CCP). This is because the CCP needs both participants to deposit initial margin and then pay or receive variation margin to either party daily, depending on the Mark to Market (MTM) value of the trade. The CCP therefore needs to have a clearing relationship with all parties. This basic approach means that a trade between a CCP member and a non-CCP member could not be cleared by the CCP. Most buy-side firms are not CCP members and therefore could not benefit from the advantages of a CCP. In response of this particular issue, certain clearing houses (LCH Clearnet for example) have started offering a relatively new service called Client Clearing. Different methodology can be used by CC to calculate margin requirements for trades that are cleared. Initial margin requirements vary by product and also by CC due to different methodologies used. Infrastructure supported by the CC is a key feature for prospective members since it imposes the model in which they will conduct their trades and build their internal processes. This concerns the connectivity to ECN (Electronic Communications Network), trade repository, real time or batch processing and reporting capabilities. The workflow followed in the clearing process differs across clearing houses. For instance, London Clearing House (LCH) clears the trade after the Clearing Broker has stepped into the trade between the Client and the Executing Broker. CME Group Inc.is the world’s largest futures exchange and has, on the other hand, proposed that both Client and Executing Broker will have their own Clearing Brokers and the Clearing Brokers will be informed of the trade after the Clearing House has agreed to clear the trade. The way in which allocations are handled by clearing houses also differs. 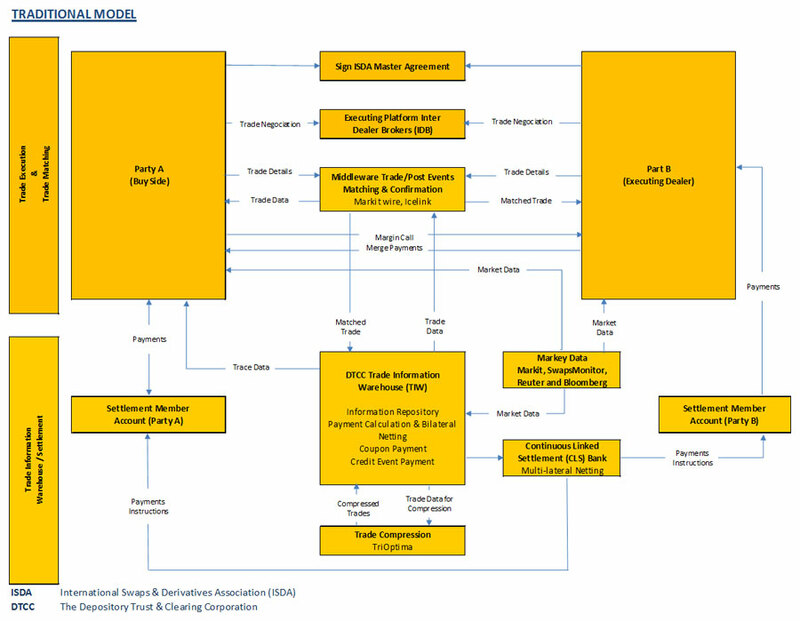 In the LCH workflow, a block trade is one where the Clearing Broker steps in and the child trade splits are later individually cleared by the Clearing house. On CME, the client can choose a different clearing broker for each split and each split proceeds independently through the clearing process right from the onset. Market participants need to ensure that their trading systems and internal tools can support the new product standards. CCP model involves the clearing house to be the counterparty to both participants of the contract. To reduce the risk of default of both participants the trades are daily Marked to Market and any variation in the NPV results in clearing house requires to transferring variation margins from on parties to the other. The margining process necessarily requires the clearing house to be able to perform a risk assessment and daily valuation of the trade using market data. This process requires standardization of the products and the clearing house must be able to support this process. 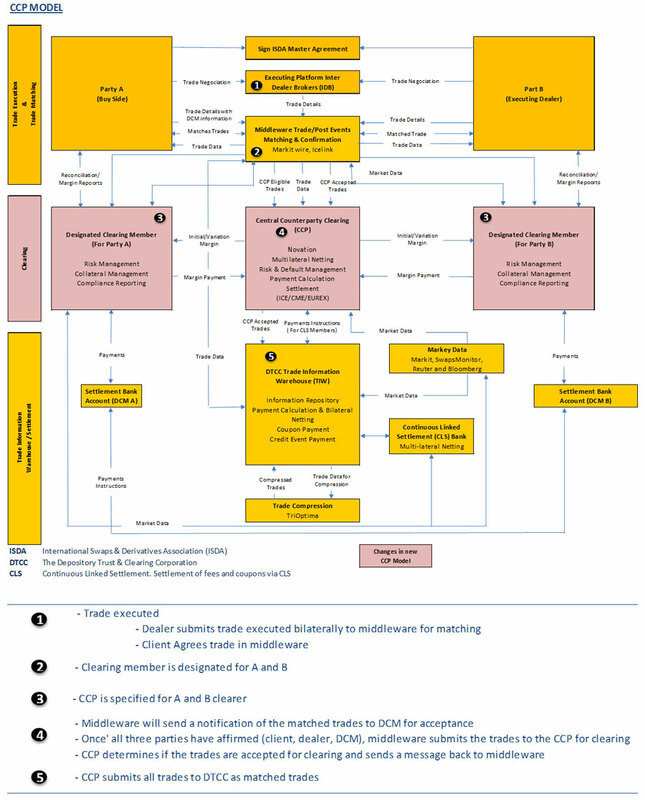 The implication is that trading and risk management systems used by market participants must be able to process the standardized products supported by clearing houses. Market participants need to upgrade their internal processes so that they can reconcile their records with clearing houses and also provide reports to clients. The fact that clearing houses are standardizing products and making more products eligible for clearing implies that clearing houses are offering to intermediate a greater variety of OTC derivative trades. This trend will clearly encourage higher volumes in such trades. Currently DTCC trade warehouse acts as a repository for a large proportion of CDS trades. Other asset class trades are soon likely to have trade repositories where market participants will need to report their OTC trades (bilateral or cleared). Lack of transparency was a major problem with the OTC derivatives market when bilateral trades were the norm. Trade details must be firstly sent to the warehouse and only later cleared by the CCP. The trend of CCP clearing is poised to increase volumes of OTC trades. Hence, if the process to report trade to the repository was semi-automated earlier, banks may now wish to automate the reporting of trades to the trade warehouse in a more streamlined manner. Market participants need to develop internal processes to deal with their obligations to the clearing house as well as to clients as Backup clearing brokers. The main goal of CCPs is to reduce the risk of counterparty default, and then it is no surprise that every CCP has a detailed CCP has a detailed set of procedures on how a default scenario is handled. This means that an STP process at a bank that worked well in processing post trade events on bilateral trades will not in general, be able to process post trade events on cleared trades, without an upgrade. Backloading: This step involves creating an electronic version of the bilateral trade based on the paper documentation of the trade. Backclearing: Once a bilateral trade is created on the electronic platform, the trade is converted to a Triparty trade and sent to the Clearing Broker. The Clearing Broker may be the original market maker (EB) itself or another bank. The Clearing Broker intermediates the trade and ends up creating two bilateral trades (with the EB and the client respectively). These two trades are then sent to the clearing house to be cleared. OTC trades sent to CCPs will be legally affirmed through electronic platforms. Then market participants need to deal with increasing volumes and therefore internal processes such as Limit monitoring will necessarily be required to be done through automated systems rather than in a manual fashion by the middle Office personnel. CCP clearing tends to increase Volumes on OTC derivative trades. Though this would mean a healthy market and more business for clearing desks, it also means that the affirmation process by a clearing broker needs to be automated to enable STP and facilitate processing of large trade volumes. Trades in complex derivatives were low in volume and some participants may not feel the need to invest in risk management capability of daily valuation in such trades. CCPs will perform a daily MTM valuation and impose margin requirements on trade participants then market participants need to develop processes to monitor in real time the margin requirements of clients and themselves and also process payments to/from the CCP. Experience shows that use of a CCP tends to result in high margin requirements for credit trades, reflecting the fact that credit swaps contain both credit and market risk. This could potentially limit participation in CCPs in the long run. Another key point concerns the responsibility for covering defaults. Within the CCP Model defaults are generally shared. This means that with the total margin held in custody from the various members of a CCP is calculated to be sufficient to cover the total exposure of each member entity. If one member entity fails and the global margin is not big enough to cover some default exposure, then other members will have to post additional funds to help offset the failed party’s exposures. In such case collateral cost will expense. Promoting CCPs Model will, by definition, concentrates and re-allocates risk. In fact the model has the potential either to reduce or to increase the systemic risk in a market. In general, there are good reasons to suppose that a central counterparty can protect a market against crisis. But this requires the risks arising to be correctly identified, priced fully and backed by adequate capital, and the procedures for allocating losses must be clearly defined and made transparent. If the procedures followed are not predictable and transparent, then the presence of a central counterparty in a market may serve to increase systemic risk. A particular problem may occur if market participants do not share in the default risk to the central counterparty and so have no interest in the exposures that it takes on. If the users do not have an exposure to the losses of the central counterparty, the users may be less likely to trade prudently, increasing the overall levels of risk in the market. Even if the central counterparty’s risk management procedures are in theory a good idea, their effectiveness still depends on the right implementation of those procedures by its management. The concentration of operational risk in a central counterparty is considerably greater than that in any individual participant in a decentralized market, and the repercussions of incompetent management would be correspondingly larger.